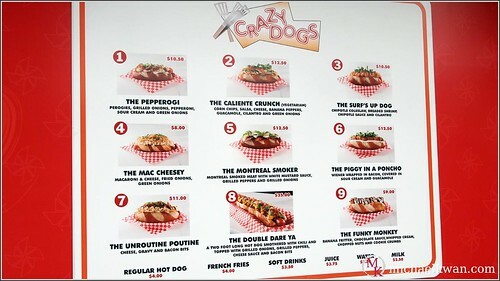 When I heard about the Crazy Dogs' two foot dog, I said to myself (and probably out loud), "I want to try that. And I'm going to eat it all myself." But the more I thought about it, the more I couldn't justify the $25 price of what's probably more than one week's serving of sodium. I also looked back at my records and remembered that a foot long hot dog (from a different concession stand) was $5. So I thought, for $25 I'd be better off buying five foot long dogs. But alas, after 4 years, the price of a foot long hot dog with grilled onions at the PNE is now $7. Good grief, it's not like it's gold (long story short, I bought and ate a foot long to wash away the taste of the Crazy Dog). Ok back to Saturday. After looking at the prices, I finally decided on the "Surf's Up Dog" mostly because it had popcorn shrimp. Everything else is mostly cheap starch. $10.50. Whew! I'm at the PNE; I can't have second thoughts about this. As you can see in my pictures, it looks good. It really does. 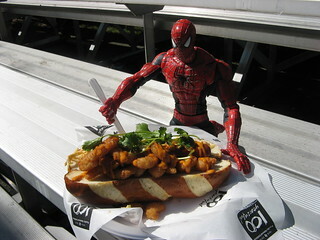 Check out this positive review (scroll down for close up of the hotdog; click on the thumbnail). It looks good in those pictures too! What's the problem Tim?! Are you just a whiny cheapskate?! Good question! And yes, I am! For $10.50 I shouldn't have ignored my second thoughts and I should've been able to expect a reasonably generous slathering of toppings because that's what's making this hotdog crazy! Isn't it? ISN'T IT?!?!?! BLUGABLOOGAUNGGHTH!!!! Whoah, not sure what happened there...crazy, haha (get it?). Anyways, here's my review. It's a gigantic pretzel bun (that's very dry) that props everything up high and that's what makes the hotdog look big. As for the toppings, on the hotdog I was served, I don't believe the servers were generous because the coleslaw was spread across the dog pretty thinly, and there's a lot of air in between of all the condiments/toppings. It looks like a lot of popcorn shrimp, but there were only 12. The equivalent of a small child's handful. A stingy, small child. Ok maybe not a small child, but what I'm trying to say is there isn't actually a lot there, for the price I'm paying for. Underneath all the toppings is a wiener (beef?) that's dwarfed by a bun that's 4-5 times it's size which is really nothing special itself. How's it taste? Good. But nothing special. My review might be coming across as harsh, which is what I'm trying to go for because I'll say it again...$10.50 for a hotdog? It better wow me. But it didn't. You hyped yourself up too much on the free promos you did on the news, PNE. It's your own fault you disappointed me. Besides, you've already made a killing on these hotdogs and will continue to do so no matter what I say. People will still buy these ridiculously priced hotdogs. 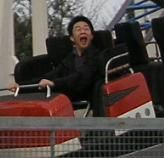 Which reminds me, the PNE isn't worth going to unless you can get in for free or very close to free. Aside from the musical acts, there's nothing much new or worth going to see, assuming you've been there in past five years or so. Long live the IKEA 75¢ hotdog. FOREVER. Saw those, but decided to try Salt Spring Noodles for $10 (large box); can't say I was disappointed. I think so, the booth was close to the main stage. You could order whatever kind of sauce on the noodles with vegetables and with or without chicken.